Illinois law enforcement agencies have played a central role in the development of local Countering Violent Extremism programs, a federal counterterrorism initiative, according to a new report released by the #StopCVE-Chicago coalition and supported by the Institute for Research on Race and Public Policy at the University of Illinois at Chicago. 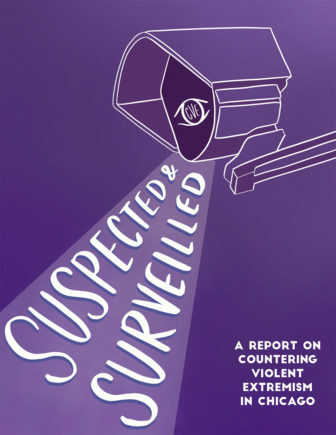 Advocates have long criticized CVE as a ‘softer’ approach to unwarranted surveillance that enlists community members and trusted professionals, like teachers, religious leaders and health practitioners, to track harmless, constitutionally protected behavior and activities as precursors to violence. These ‘indicators’ can include political grievances, feelings of isolation or hopelessness, economic status, and mental health struggles. Opponents argue that such programs are based on an unsubstantiated theory of ‘radicalization’ that stigmatizes American Muslims as uniquely predisposed to violence — the same thinking that underpins other invasive counterterrorism efforts such as domestic spying and infiltrating Muslim communities with informants. The report is based on Freedom of Information Act requests filed with the Illinois Criminal Justice Information Authority, which was awarded a nearly $200,000 CVE grant from the Department of Homeland Security in 2017, the group’s CVE community partners and other officials ICJIA has contacted about the program. The records also confirm that ICJIA has struggled to enlist non-law enforcement entities to partner with them in CVE programs, stating in its quarterly report that an Albany Park mosque, Makki Masjid, “disengaged in the project citing concerns over discrimination against the Muslim community.” Several organizations listed as community partners in its initial CVE grant application had not committed to implementing the program, WTTW reported. CVE was launched as a formalized domestic counter-terrorism program in the United States in 2014 through pilot programs in Boston, Los Angeles, and Minneapolis, and expanded to fund 31 groups across the country during the final days of the Obama administration. The Trump administration then decided to narrow its scope, controversially revoking funding for some groups including Chicago-based Life After Hate, one of the only grant recipients dedicated to de-radicalizing neo-nazis and white supremacist extremists, and focusing more on law enforcement. The report found that two years later, local CVE programming is still in the early stages of development but that the ICJIA is enlisting local law enforcement agencies, including the Chicago Police Department and the Elgin Police Department, to facilitate community relationships and inform the development and implementation of bystander trainings. ICJIA has conducted at least one training for mental health professionals to learn how to prevent violent extremism and earn continuing education credits in partnership with UIC and has held nine focus groups as of last year. Documents also show CPD officers initiating conversations between ICJIA and officials at Chicago Public Schools about CVE programming. Researchers liken the premise and potential harm of CVE to that of gang databases as both use non-criminal behavior and other qualities as questionable metrics to qualify whether individuals are susceptible to violent behavior or recruitment by violent groups. And identification on a terrorist watch list or gang database can have enormous and unknown consequences. ICJIA officials declined to be interviewed but provided a statement on the report. Transparency remains the biggest barrier to understanding how CVE is being implemented in Chicago and Illinois, as the records obtained by the #StopCVE-Chicago coalition paint a significantly different picture than the information publicly available about CVE programming, Nguyen said. Muslim Advocates, a civil rights organization, and the American Civil Liberties Union of Illinois have also filed FOIAs with Illinois government agencies to release information on how CVE programs operate in the state. On the federal level, the Chicago-based Arab American Action Network sued the Department of Justice, the Department of Homeland Security, and the FBI to release records about how CVE has spread in Illinois. Lucy Parsons Lab has also obtained and published documents about CVE funding and implementation in Chicago. The #StopCVE-Chicago coalition wants the city, CPS and UIC to refuse or end partnerships and practices that enable CVE implementation and offer tips for community members to recognize and refuse participation in what may be CVE-related programs. Asraa is the digital editor at The Chicago Reporter. Email her at amustufa@chicagoreporter.com and follow her on Twitter @AsraaReports. Three years ago the Illinois Department of Human Services won a grant from the Ford Foundation’s Work Support Strategies program to “streamline” its offices. The problem: The number of clients was rising as the economy collapsed, and staff had been reduced by 40 percent in recent years.